Following the tentative direction of 'Another Monday' I suppose this is in the half-and- half department. If not exactly hedging the bets at least a gradual easing in. Sir Gawain and the Green Knight sink a few on the Southside. But this time a real studio, Sound Techniques in Chelsea with engineer John Wood. And one big production number featuring a cast of six or seven. Side A comprised mainly of jazzy/bluesy material, some with hand drum played by Terry Cox who together with Danny had been in Alexis's band and moonlighted down at the Cousins and now completed the Pentangle lineup. And side B was more renaissancey/medievally sounding with folk tunes arranged somewhat in that vein. Windham Hill took it on board thereby conferring full new-age status. I heard a story that it was William de Kooning's favourite record. Or at least that he relentlessly subjected some of his followers to it side after side at an all day paint-in. So I like to think that it changed the course of western visual art as well. The musicians involved were all great players and included Ray Warleigh, Roddy Skeeping and David Munrow. 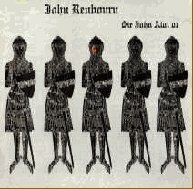 An instrumental album (originally called Sir John Alot of Merrie England) featuring Renbourn with his Pentangle bandmate Terry Cox on percussion and Ray Warleigh on flute. Originally released in England in 1968, the same year that Pentangle started to record, Sir John Alot was steeped largely in English folk music. Highlights include "The Trees They Do Grow High" (aka "Long A-Growing"), solo guitar miniatures such as "Lady Goes to Church," the epic "Morgana," with its sharply nuanced tempo and timbre changes, and the sprightly "My Dear Boy." Some parts of this album are surprisingly contemporary-sounding, such as the bluesy "Transformation," which sounds like "What'd I Say" transposed for acoustic guitar and African drums; "White Fishes," which veers dangerously close to quoting George Gershwin's "It Ain't Necessarily So" and Rodgers & Hammerstein's "My Favorite Things"; and "Sweet Potato," which sounds like a folk-rock song without words, even as Renbourn quotes "Satisfaction" at one point. Terry Cox - Finger cymbals, African drums, Glockenspiel.